BlackFly brings lots of Canadian drink choices to most of Canada and a few US states. 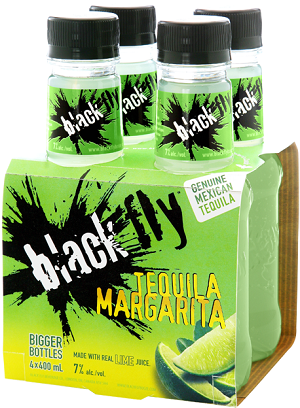 BlackFly creates a variety of products from Vodka Cranberry to Tequila Margarita to Whisky Sour to Rum Mojito. Disclosure: I received samples to test and review. All opinions are mine. We received Tequila Margarita and Whisky Sour to test. Uses real ingredients such as real cane sugar as opposed to high fructose corn syrup. The drinks are less sweet than other drinks of a similar nature. This was intentional and will be appreciated by those who prefer a drink that isn’t overly sweet. If that’s not you though, expect it to be more sour than you are used to. For a unique look at how BlackFly drinks are made, you can check out a video on their homepage from the Food Network show Food Factory. Where to Buy: Available in Canada (except Nunavut and Quebec) as well as Illinois, Arkansas, Alabama and Massachusetts.